Work to deliver a bigger and better Metrolink network will result in some upcoming disruption to services on the Eccles line. The closure is to enable work to take place that will link the new Trafford Park line, currently under construction, with the existing Metrolink network at Pomona. The line will close for 13 days after the last service on Friday 27 July. This means that there will be no tram services running between Cornbrook and Eccles from Saturday 28 July to Thursday 9 August 2018 (inclusive), while services from Ashton-under-Lyne will terminate at Deansgate-Castlefield. It will also enable us to work with Metrolink operator KeolisAmey and other partners to carry out additional enhancement works at the same time, reducing the need for future disruption. The works have been timed to coincide with school summer holidays when, traditionally, fewer people travel on the network. They have also been condensed into a single 13-day closure, preventing disruption over many weekends. We are working hard to minimise disruption to customers and stakeholders and have taken a number of steps to achieve this. We are keeping media, public and stakeholders updated before, during and after the works and extra staff will also be present in key locations and at key times to answer questions and help people get around. During the works there will be a full bus replacement operating including additional services during peak times. Please see the section below to find out where you can pick up your replacement bus service. The travel advice on this page will be continually updated throughout these works and should help you to plan your journey and make travel easier. Plan ahead and expect journey times to be increased. Replacement bus services will be in operation along the Eccles line during these works. Please ensure you are familiar with replacement bus departure points before you travel. There will be signage directing passengers to replacement bus services at all affected stops. Please ensure you have a valid Metrolink ticket before you travel. Additional Metrolink staff will be available to help and assist you. Further work, including the resurfacing of roads, will take place during the period of closure. Please familiarise yourself with these, and consider retiming or rerouting your journey where necessary. Follow @OfficialTfGM and @MCRMetrolink for live and up to date travel information and advice throughout the works. A replacement bus service will be in operation along the Eccles line during these works. Piccadilly to Eccles - Calling at Piccadilly, Deansgate-Castlefield, Cornbrook, Trafford Bar (towards Eccles only), Exchange Quay, Salford Quays, Harbour City, MediaCityUK, Langworthy, Weaste, Ladywell and Eccles – 12 minute frequency. Piccadilly to MediaCityUK – Calling at Piccadilly, Deansgate-Castlefield, Cornbrook, Trafford Bar (towards MediaCityUK only), Exchange Quay, Salford Quays, Harbour City and MediaCityUK - 12 minute frequency 7am – 8pm. Piccadilly to MediaCityUK (Express Service) – Calling at Piccadilly, Deansgate-Castlefield, Cornbrook, Trafford Bar (towards MediaCityUK only) and MediaCityUK – 6 minute frequency 7.15am – 9.30am and 4pm – 6.45pm. You can find your replacement bus stops during these works here. Please note that during the works, no replacement bus service will be able to serve Pomona (use Exchange Quay) and Broadway (use Harbour City or MediaCityUK). Please ensure you purchase your ticket either on the Metrolink stop or using the getmethere app prior to boarding a replacement bus service. During the closure, we will also be working with the Metrolink operator KAM and other partners to carry out additional works at existing Metrolink stops and at other locations along the Eccles route. Pomona. / Exchange Quay – there will be 24 hour/7 day working that will involve concrete cutting by saw and drilling on the existing viaduct structure. Noise reduction measures will be in place around the noise producing works to minimise any potential impact. Cranes will be used to lift new rail into position. Work will take place on both roads ‘off-peak’ between 9.30am and 3.30pm and, due to the nature of the work, may be quite noisy during these times. 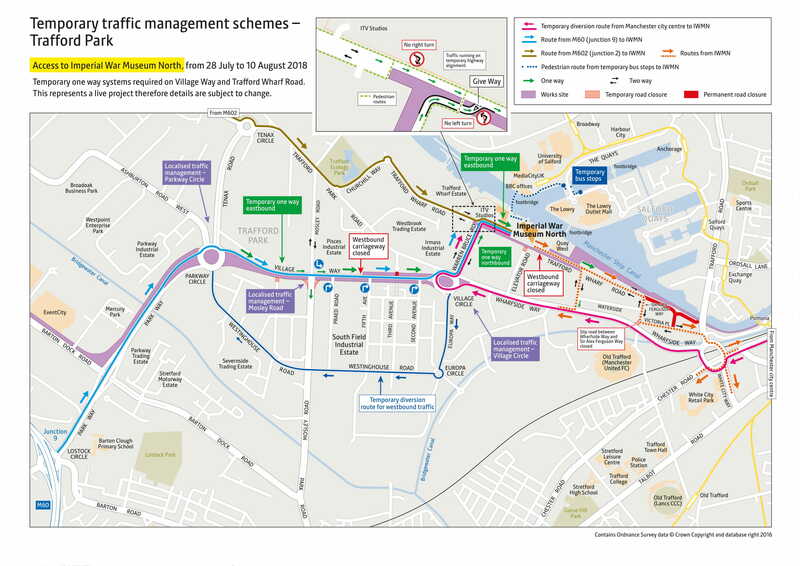 During the works lanes will be restricted and some temporary traffic lights will be used for traffic management. There is also a possibility that there will be a southbound closure of South Langworthy Road from Eccles New Road to Montford Street, for three days. Access to business will be retained at all times. IWM North will be marking the end of the First World War Centenary with an exhibition on Remembrance. Lest We Forget? will run from Friday 27 July to Sunday 24 February 2019. The museum will still be fully accessible during the Eccles line works, with a bus replacement service in operation. Click here to find the replacement bus stop locations for MediaCity and other Metrolink stops. A number of temporary traffic management schemes are also in place close to the museum as work to deliver the new line progresses. Providing additional support on social media channels @OfficialTfGM and @MCRMetrolinkfor live travel information throughout the affected days. Helping to raise awareness of the road closures associated with the works by advising people of what they can do to make their journey easier. Liaising with transport operators during the affected days. Enhanced monitoring at its network control centre so traffic flows can be optimised by altering signal timings.